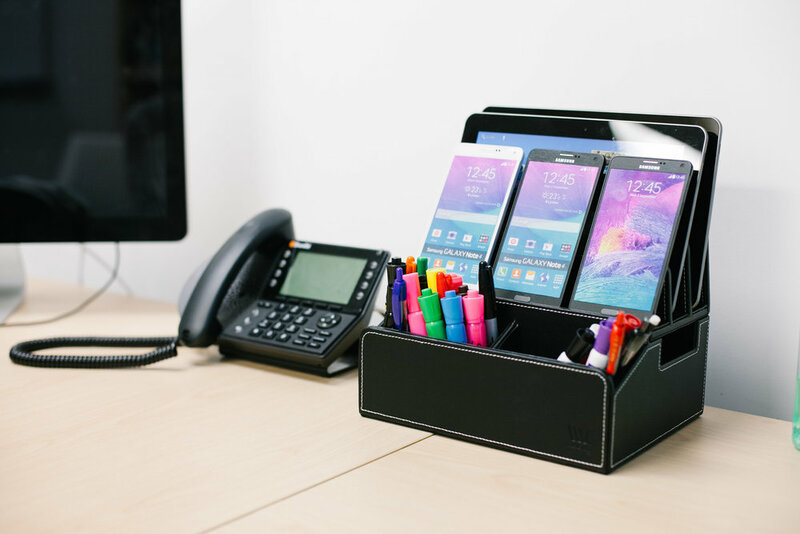 Found the perfect stand and charging organizer but still need a little extra storage room? The Executive Caddy Add-On was designed to solve just that. Clip this extension compartment and designate a space for notepads, pens or pencils, keys, remotes and more. Measuring over 4.5” across and nearly 2.5” deep, there is plenty of cubby room available. Keep cell phones, tablets, remotes, and more organized and neat in one spot. Universally compatible with nearly any Apple and Android device with space to hold up to three smartphones, a tablet and a laptop. Two cubby holes measuring nearly 5 inches across and 3.5 inches deep allow storage for office supplies, notepads, pens, pencils, keys, and other smaller items. Incorporate the Executive Stand and Charging Organizer with Extension into any family room or communal area for an attractive and functional storing option for all gadgets. A thoughtful and useful gift for any friend, family member, and organized tech user.